When you arrive at Seven Gables Inn, you'll be welcomed with the finest of "personalized Hospitality." 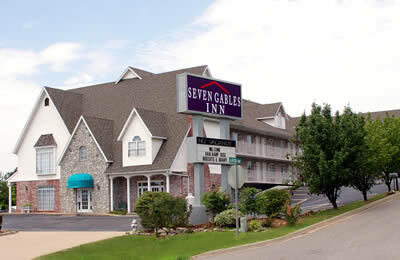 This property is simply in the heart of Branson! Welcome to Seven Gables Inn. We are committed to providing our guests with a great experience and we welcome you to your “home away from home”. We are in the perfect location, one block south of the Titanic Museum, within walking distance of the strip, the Clay Cooper Theater, and many restaurants. Our clean and spacious rooms include Pillow Top mattresses, LCD flat screen TVs, mini fridge, microwave, and in-room coffee. Be sure to try our complimentary hot deluxe breakfast, made fresh every morning - which includes Belgian waffles, sausage gravy, biscuits, oatmeal, an egg breakfast casserole, fresh fruit, four types of cereal, donuts, toast and refreshments. Need discount show tickets? We can book and reserve all shows for your convenience. So come on in and experience genuine hospitality. We would love to have you! We Have Show Tickets Available!